This website is designed to educate and inspire you to grow many different herbs as possible and use those herbs you’ve grown. I operate a small lavender herb farm here in central Vermont and my focus is lavender for skin care, aromatherapy, culinary and herb gardening. With over 40 years of gardening experience, writing articles, website development plus growing many medicinal herbs. Hemp full spectrum and CBD are added to my skin care products to help my customers with dry skin, mature skin, psoriasis and eczema. When some of my family members and I developed psoriasis and eczema we needed a safer alternative rather than the commercial brands we currently we’re using. So, I created a natural skin care line not only using my own lavender and other herbs but adding hemp CBD to my products. The results were amazing! My skin care line includes handmade artisan soaps, balms, lotions, salves, lip care and aromatherapy products. Many of the products include full spectrum cold processed hemp oil, cannabidiol CBD, CBD isolates, herbal extracts, herbal infusions, rose hip oil, Argan oil and many other skin nourishing oils and butters. The certified organic essential oils used are 100% pure therapeutic grade providing aromatherapy and natural skin care benefits. The different herbs grown here include cilantro, coriander, dill, hot peppers, lavender, parsley, roses, rosemary, thyme and many medicinal herbs like astragalus, ashwagandha, black cohosh, chamomile, Echinacea, stevia, sweet cicely and wild ginger. The fruits I grow are four varieties of currants, black and red raspberries, Aronia berries, blueberries, cranberries, sea buckthorn berries, elderberries, loganberries, jostaberries, blackberries and gooseberries. There are more herbs and fruits I grow along with vegetables for my products, family and farmers’ markets here in Vermont. Some of these herbs are used in my skin care products or culinary herbal teas. 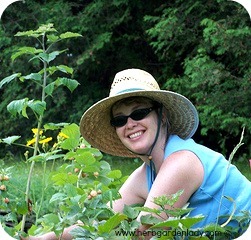 All my herbs and fruits are grown organically meaning you won't find any chemicals or pesticides used on my herb farm. My chickens are the pest controllers and they do a wonderful job. I use only the freshest herbs and carefully dried herbs for retain their aromatic flavors and essential oils in my lavender products. I have an online web store where I sell natural lavender and hemp products for skin care. There’s lots of information on essential oils, aromatherapy, CBD for skin care, articles, DIY projects, about me and more at https://www.vermontlavender.com and don't forget to like me on Facebook, Pinterest or YouTube.